Personalization has swept through our lives: entertainment, news, dating, food options — it's all endlessly customizable. Your event is no different. Attendees want to curate their event experience, from the agenda, speakers and breakout sessions to the photos they browse and social media they follow. They don’t want to miss out on networking opportunities — they want to meet the right person at the right time. With a personalized event app, people can tell you where they are, what they’re feeling and what they need in real time. Take advantage of every opportunity to make their experience one-of-a-kind. Upon arrival, one of the first things your attendees will do is head to a registration desk. Using a kiosk is actually a great opportunity to speed attendees through registration and to start the event off on a personalized note. First off, if they prefer to go by a nickname, they can update their name directly on screen. You can also use registration data to serve up important messages and reminders right on the kiosk. For example, if an attendee hasn’t downloaded the app, you can remind them to do so (this will only be shown to those who haven’t already downloaded). If they haven’t registered for their sessions or answered their networking questions in advance, you can remind them and offer the opportunity to do so onscreen. All of these messages can be personalized to appear only to relevant attendees. Personalized messaging and content is all about delivering the right message to the right person at the right time. As with the initial kiosk registration, individual session check-ins are a perfect opportunity to deliver a personalized message. When attendees check into a session using their event app, additional content becomes available (via beacon technology). Send a targeted welcome message, instructions, or gather feedback with a poll or survey. Events are often a whirlwind of activity, and it can be a challenge for attendees to coordinate meetings with vendors, exhibitors and other attendees. MeetingPlay’s appointment scheduling feature helps solve this problem. With appointment scheduling, attendees can set up and manage live appointments with exhibitors (or any other meeting attendee) before or during an event. For example, this is helpful if an attendee wants to meet with a vendor, but the vendor’s booth is packed. 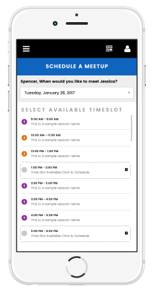 Instead of waiting around for a meeting (or missing the opportunity), appointment scheduling allows attendees to meet on their own schedule. 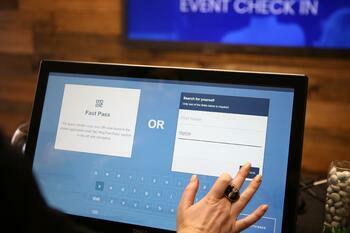 A good event app has the flexibility to become a personal space for your attendees during the event. Note-taking can be a big part of the event experience; it’s how you remember and collect important info. Notes are accessible in the MeetingPlay app through the attendee’s personal right-side panel. These notes are available after the meeting is over, so they can keep track of everything they want to reference after the meeting. Attendees can also tap a button to email all the notes to him or herself. 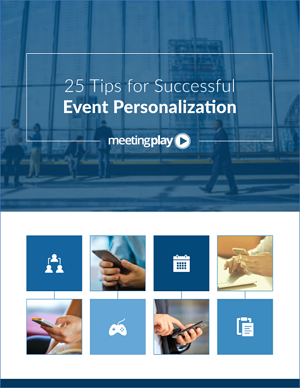 In this ebook, we cover 25 different ways to personalize your event - before, during and after the event. We’ll show you how to make your attendees feel like they created their own experience, because when you make them feel like their voice is valued, they’ll give you their attention (and engagement) in return. Click here to download. If event personalization is a priority to you, we are here to help! Contact us today to learn more about how our event apps can help at your next event.